"Then shall the righteous answer him, saying, Lord, when saw we thee an hungred, and fed thee? or thirsty, and gave thee drink? When saw we thee a stranger, and took thee in? or naked, and clothed thee? Or when saw we thee sick, or in prison, and came unto thee? 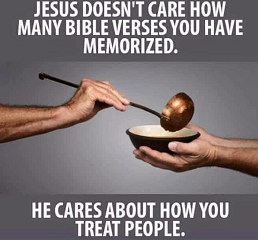 And the King shall answer and say unto them, Verily I say unto you, Inasmuch as ye have done it unto one of the least of these my brethren, ye have done it unto me." Sick, and in prison, and ye visited me not." The message appears clear and easy to understand. Personal salvation is by works only. It is given to all those who care for the poor and disadvantaged -- people who care for anyone who is without food, without friends, in need of clothing, are sick are imprisoned, etc. Salvation and eternal life in Heaven is denied to anyone who did not help the needy while he or she was alive on Earth. One interesting twist is that the "sheep" were surprised that their good works were in any way related to Jesus. They had apparently helped the poor and disadvantaged out of love and compassion, and not with any expectation that their good works would have an effect on their eternal destiny. One interesting feature of this passage is that salvation is solely based upon a persons acts of charity to others; it is in no way dependent upon what the individual believes about Jesus' status, or what God -- if any -- the person worships. So, Matthew 25 would imply that Agnostics, Atheists, Baha'is, Buddhists, Christians, Deists, Hindus, Muslims, Satanists, Wiccans, and others will attain Heaven after death if they are kind to others by observing their faith's Ethic of Reciprocity -- the Golden Rule. The literal, straight-forward interpretation of this passage reveals that salvation is by works, not faith. This is a profound thought, which leads directly to religious inclusivism and pluralism. This conflicts with the teachings of many religions that only their followers will attain Heaven. Also, fundamentalist and other evangelical Christians generally teach that salvation is by faith, not works. They have various alternate interpretations of this passage that make it compatible with their beliefs. This passage appears, with a few differences, in Mark 10:18-23, Matthew 19:16-23 and Luke 18:18-24. Most conservative Christians believe that the authors of the Gospels were inspired by God to write material that is completely free of error. So it does not matter much which of the parallel passages is studied. Most liberal Christians believe that Mark is the first of the four canonic Gospel to be written. The anonymous authors of Matthew and Luke extensively recycled material from the Gospel of Mark circa 80 and 90 CE. Since the original message of Jesus became corrupted with developing oral traditions in the decades after Jesus' execution, the earliest Gospel would be typically the most accurate. "And when he was gone forth into the way, there came one running, and kneeled to him, and asked him, Good Master, what shall I do that I may inherit eternal life? And Jesus said unto him, Why callest thou me good? there is none good but one, that is, God. Thou knowest the commandments, Do not commit adultery, Do not kill, Do not steal, Do not bear false witness, Defraud not, Honour thy father and mother." The first two versesin this passage are curious. The person asking Jesus what he must do to inherit eternal life -- that is, to be saved -- referred to him as "Good Master." All three gospels agree on this wording. Jesus replied that only God was good, and implied that everyone else is not good, including himself. This is one of the verses used by the original Christians -- the Jewish Christian movement which was centered in Jerusalem under the leadership of James, the brother of Jesus. The verse supported their belief that Jesus was fully man, was the latest and greatest of the Jewish prophets, was not a God, and was not conceived in a virginal conception. Being a fully human prophet, Jesus would have sinned, and thus not been completely "good." The Pauline Christian movement, which arrived on the scene some years after Jesus' execution, disagreed with these beliefs. It expanded and eventually became the Catholic Church. Exodus 20:12: 7th commandment: Do not commit adultery. Exodus 20:13: 6th commandment: Do not kill. Exodus 20:15: 8th commandment: Do not steal. Exodus 20:16: 9th commandment: Do not bear false witness. Exodus 20:12: 5th commandment: Honor one's parents. To worship no other God than Yahweh. To not make images and bow before them. To not take the name of Yahweh in vain. To keep Saturday, the Sabbath day, holy. The implication appears to be that one's beliefs about, and responses to, God are not important to one's salvation. Only one's works -- particularly those activities involving other people -- that are important. Jesus also does not include the 10th commandment as needed for salvation. It states that one is not to covet any of one's neighbor' possessions: their house, wife, male slave, female slave, animals, etc. The books cited are not necessarily still in print. Philip Comfort, Ed., "New Commentary on the Whole Bible," Tyndale House, (1990), Page 89-90. Harold Willmington, "Bible Handbook," Tyndale House, (1997), Page 544. Charles Laymon, Ed., "The Interpreter's One-Volume Commentary on the Bible," Abingdon Press, (1971), Page 639 - 640.